I have been looking forward to see this movie for a while now. So when I found out that the movie would be playing on 15 November, I rescheduled all my plans to especially see this one on its premiere date. The tickets were already sold in advance since last Saturday and it was quite challenging to get the seats in my favorite cinema with Dolby Atmos system, but luckily we still got nice seats in the middle of another nice theater not far from our home. Well let's get on to the movie now! Not long after the events from Batman Vs Superman: Dawn of Justice, Batman/Bruce Wayne (Ben Affleck) found out that some kind of demon-like creatures seemed to be threatening the world. It would later on be revealed that those creatures were the armies of a very powerful demon god named Steppenwolf (Ciarán Hinds - Tinker Tailor Soldier Spy, Hitman: Agent 47 etc) who was looking for items hidden on earth. They seemed to gain courage after the death of Superman. Realizing that the threat was too big to handle by himself, Batman with the help from his butler Alfred (Jeremy Irons - Beautiful Creatures, Margin Call etc), believed that they need to form an alliance with other people with special abilities to fight against Steppenwolf and his creatures called parademons. At the beginning, only Diana Prince aka Wonder Woman (Gal Gadot) has agreed to assist Batman. So Bruce and Diana had to share the responsibilities to convince Arthur Curry/Aquaman (Jason Momoa - Conan the Barbarian, Game of Thrones TV series etc), Barry Allen/The Flash (Ezra Miller - The Perks of Being a Wallflower, The Stanford Prison Experiment etc) and Victor Stone/Cyborg (Ray Fisher) to assist them. So how would Bruce and Diana manage to convince all to help? What was the real intention of Steppenwolf? And could the Justice League fend off the imminent threat from Steppenwolf? Find them all in this truly exciting DC superheroes movie. Wooooow! This movie was everything that I could hoped for in a team of superheroes movie. It was fun, intense, exciting, full of action and humor at the same time. And overall one heck of a very entertaining superhero movie. This time, I was feeling excited throughout the movie. I had lots of fun watching this movie from beginning till end. The start of the movie was already making us intrigued, then slowly the revealing of other superheroes were totally cool. It was very enjoyable to see one by one introduced to us. When Wonder Woman was shown again, my wife was very ecstatic and she immediately was reminded why she loved that movie so much. Then when we were shown The Flash, Aquaman and Cyborg's abilities when they teamed up to fight Steppenwolf, it was amazing. But what was very enjoyable was actually the performance of Ezra Miller as the Flash, who was characterized as very fun, young superhero. He was able to make me less upset for taking over the role which I thought should have gone to Grant Gustin who portrayed as the Flash in the TV series. Lots of the funny moments involved him. Jason Momoa I think suit the role of Aquaman (and I cannot wait to see his solo movie in 2018). While Cyborg was the one character that felt not too much explored (perhaps only my feeling), although he did have brief moment of fun when relating with Barry Allen. The action sequences here were absolutely thrilling, intense and greatly done. There were so many of them that I loss count (not that I was really counting anyway). 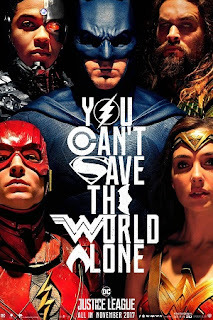 The solo fights of the superheroes, their brief internal fights and of course the climax scene which was totally awesome but still showed a bit of surprisingly funny moment (be sure not to miss that part). There were not a lot of dramatic moment here but as a movie of superhero team, this one certainly did not disappoint. Fans of DC comics should be totally entertained by this movie which I think truly gave us a very huge satisfaction. My wife and I who are fans of comic superheroes, were really satisfied and absolutely thrilled with the whole movie. We even think of possibly watching the movie once again. The special effects and the sound effects were awesome! I am confident that you would get an even better experience watching it in a good quality theaters, especially ones with Dolby Atmos or in IMAX as it was shown in the end credit scene that the movie was specially formatted for IMAX. Talking about the end credit scene, there was 1 fun scene in the middle and another important scene at the very end which would give us excitement of the future movie of DC Extended Universe. Btw, the movie was directed by Zack Snyder but there was no Joss Whedon's name as co-director, despite he did few reshoots of the movie. Not sure which were the ones done by him and I am not sure either whether he was the one breathing fun into the movie. Whatever it was, it surely worked as the movie was fantastic. And I for one was still feeling happy and excited after watching this movie. I had seen brief news that the movie was not being savaged by critics, though it was not very highly regarded by them. However, I would not worry about that part and I think you should totally ignore whatever critics were saying. Just go and enjoy the movie. I know that some people still could not find the good in the movie, perhaps due to the bias/low expectation, or being fan of Marvel comic movies, but I totally feel that it would be a shame if this movie was not enjoyed as a fun superhero movie. I honestly hope it would make most people satisfied. I am really recommending this to be seen as soon as you can, so you could discuss the movie with your friends or families. Btw, due to its light and fun nature and not too obvious scenes of victims died (which was a complete opposite of the dark nature of previous DCEU movies), I think this one could be enjoyed by the younger audience as well.